Find the cheapest SFO parking rates by using the search bar below. Where can I park for SFO Airport short term parking? Short term parking is offered near all San Francisco Airport terminals. Hourly parking is available at nearly all SFO Airport terminals which includes: SFO Airport Domestic Parking Garage, SFO Airport International Parking Garage, and the SFO Airport Long-Term Parking Garage and Lot. 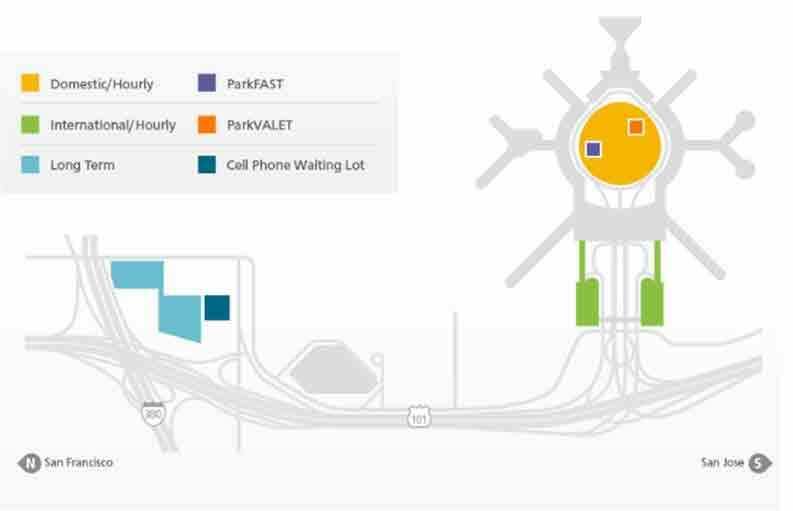 If you need any short-term SFO parking, you’ll be ok in almost any on-site SFO Airport parking garage and lot except the SFO Airport ParkVALET and the SFO Airport Cell Phone Waiting Lot. What are the rates for SFO Airport short term parking? Paid short-term SFO parking starts at $2 per 15 minutes at the SFO Airport Long-Term Parking Garage and Lot, SFO Airport Domestic Parking Garage, and SFO Airport International Parking Garage. The max rate for SFO Long-Term Parking Garage is $24 per 24 hours and the SFO Airport Domestic and International Parking Garage max rate is $36 per 24 hours. Does San Francisco Airport offer free parking? Yes, SFO parking is free for friends and family who are picking up arriving passengers at the SFO Airport Cell Phone Waiting Lot. The maximum wait time is 60 minutes and vehicles must be attended at all times. Parking space is available on a first come first serve basis and is available for non-commercial vehicles only. Please keep in mind that the SFO Airport Cell Phone Waiting Lot is closed from 1:00 AM to 5:00 AM. Where can I park for SFO Airport long term parking? 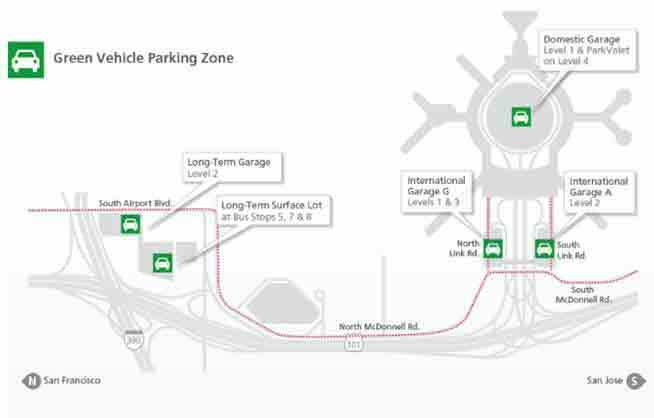 San Francisco Airport long term parking is offered at the Long-Term Parking Garage and Lot located near South Airport Blvd and San Bruno Ave, as well as at the SFO Airport Domestic Garage and SFO Airport International Garage. San Francisco Airport offers valet service parking, ParkVALET, and is located on level 4 of the Domestic Parking Garage. There are also many off-site long term SFO parking options with the cheapest rates. What are the rates for SFO Airport long term parking? SFO long term parking rate starts at $25 per day at the Long - Term Parking Garage and Lot while the SFO Airport Domestic Parking Garage and SFO Airport International Parking Garage is $36 per day. SFO luxury valet parking service, ParkVALET, has a parking rate of $45 per day. Are shuttles offered for San Francisco Airport long term parking? Yes, free shuttles are offered for both on-site and off-site long term SFO parking. The free shuttles run every 5-15 minutes, and are round-trip. Most shuttles operate 24 hours a day, 7 days a week. Are there other forms of transportation around San Francisco Airport? Yes, San Francisco Airport does offer other options for getting in and around the SFO Airport, called the AirTrain. The SFO Airtrain is free to use. There are 9 AirTrain Stations in and around the SFO Airport, stopping at each SFO Airport Terminal, Domestic Parking Garages, International Parking Garages, Rental Car Center, and West Field Road. There is an SFO AirTrain station that the Bart Station connects to, but no SFO Airport AirTrain line goes directly to CalTrain or a CalTrain Station. Can SFO Airport parking be reserved? Yes! Just visit Way.com to reserve your San Francisco parking space today! You can also download the Way app on Apple or Google Play. Is there a EV charging station at the SFO Airport? Yes, SFO Airport parking does provide a few EV charging stations. All SFO Airport parking garages have a charging station with the SFO Airport Domestic Parking Garage providing electric car owners with the most stalls at 60 EV charging stations. Where can I find SFO Airport Parking discounts and coupons? You can find cheap San Francisco Airport parking and deals through websites and apps like Way.com, Groupon, RetailMeNot, and Ebates. You can also find up to date news and events on the official SFO airport parking page. San Francisco SFO airport is located at San Francisco International Airport, San Francisco, CA, 94128. SFO airport can also be contacted by calling +1 650 821 8211 or 1 800 435 9736.